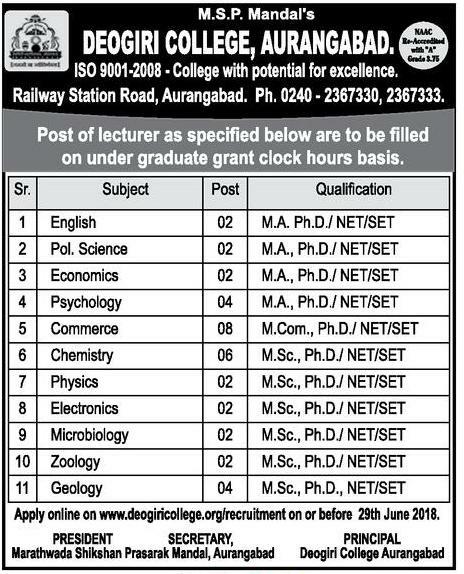 Deogiri College Aurangabad (Deogiri College), Aurangabad Published Job Notification for 36 Lecturer Posts. Candidates who wish to apply must look at Deogiri College Aurangabad Lecturer Recruitment 2018. Eligible candidates can apply Online before 29-06-2018. Education Qualification: MA/Ph.D/NET/SET/M.Sc/M.Com and More. For Post wise Education Details follow the detailed advertisement. Interested & Eligible candidates can apply Online through the website deogiricollege.org earlier than the due date. Starting Date, Last Date to Apply Online at Deogiri College which candidates should be remembers as follows. Start Date to Apply Online: 22-06-2018. Last Date to Apply Online: 29-06-2018.